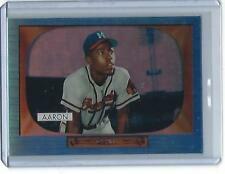 Hank Aaron #16/23. 1969 Reprint. A nice Aaron reprint chrome card from the 2000 Topps set. I do combine shipping for multiple winners. While cleaning out my son's room, I found boxes of Baseball Cards that he no longer wants These cards have been under the bed for more than 10 years. Protected from the sunlight and in a non-smoking household. 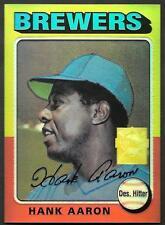 You are bidding on an original 2000 Topps Chrome Refractor Hank Aaron Reprint #30. Reprint 5 of 23. Not graded. Just like new. Thanks for looking and bidding. 2000 Topps HANK AARON #250 Reprint Card #14 of 23. Condition is Like New. Shipped with USPS First Class Package. 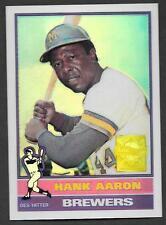 HANK AARON 1972 TOPPS REPRINT (1999 # 19 OF 23) CHECK AND PAYPAL ACCEPTED. WINNER PAYS $3.50 SHIPPING AND HANDLING. I DO COMBINE SHIPPING FOR MULTIPLE AUCTIONS WON OR PURCHASED. 1991 Upper Deck Baseball Heroes Hank Aaron Set Header & Numbers 19-27 JK7. The card is numbered and signed by artist on the reverse side. What you see is what you get. Only 10 cards in the world, size about 2.3" x 3.3". "1999 Topps Reprint 1958 Hank Aaron #30, Nmt Condition"
2000 Topps Reprints Hank Aaron #11 of #23 Milwaukee Braves Comm. Set Insert HOF.